Washington is struggling, again, with a government shutdown. But this time a nonbudget issue is driving much of the debate: the Deferred Action for Childhood Arrivals immigration program, or DACA. Congressional Democrats are demanding that President Donald Trump make good on his promise to protect the immigrant group often called “Dreamers” after pushing off a resolution on the issue in December. Why are Democrats drawing a line on DACA? One reason is the numbers on the issue seem to favor the party in the polls and at the congressional district level. On the whole, polls show DACA is popular with Americans. 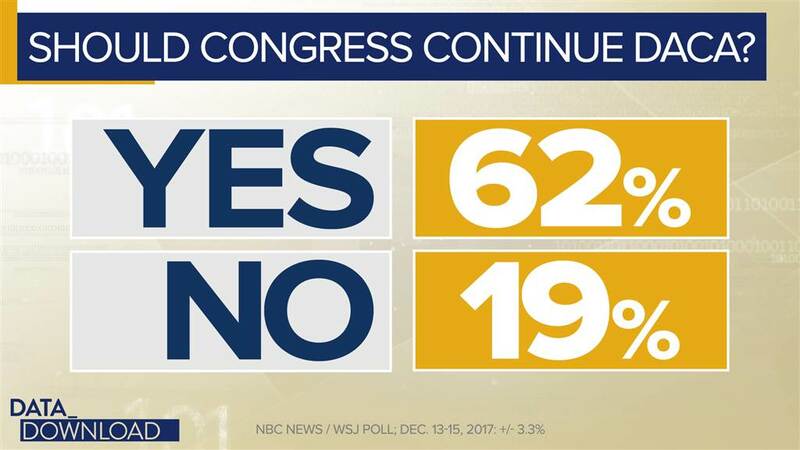 In the December NBC News/Wall Street Journal poll, 62 percent said it should be continued. Another poll this week found 87 percent of people wanted the Dreamers to stay provided they met requirements such as working or going to school. In a country that is divided on almost everything, those are consensus numbers. Beyond simple public sentiment, there may also be more direct political ramifications in a year when all of Washington is looking ahead to midterms in November. There are 142 congressional districts that have Hispanic populations greater than the national average, about 18 percent, and 52 of those districts are currently held by Republicans. Among those 52 GOP-held districts, 18 are already rated as competitive by the Cook Political Report. A Republican failure to fix DACA could drive up turnout among Hispanic and swing voters in those districts. Hispanic Americans already lean strongly against Republican control of Congress. This week’s NBC/WSJ poll found that 64 percent of Hispanics preferred the Democrats control the Congress, compared to 19 percent who favor Republican control. The impact for these GOP-held districts hits primarily where you think it would, along the southern border of the United States, including Florida, which sits close to islands with large Hispanic populations including Cuba and Puerto Rico. 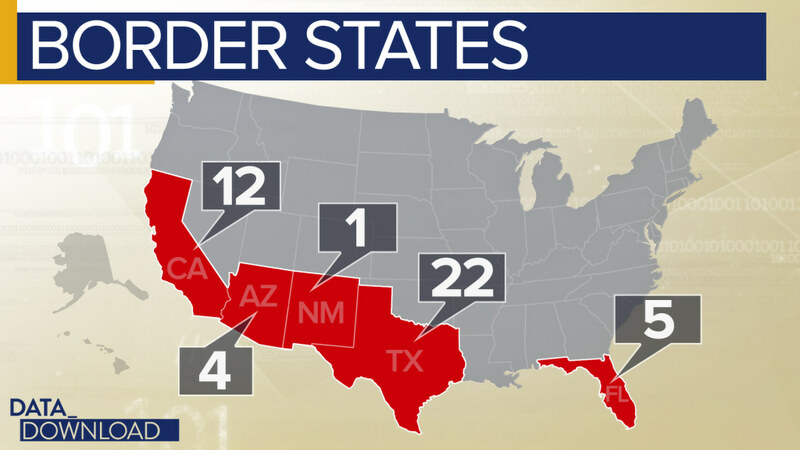 There are 22 in Texas, 12 in California, five in Florida, four in Arizona and one in New Mexico. But the list of districts also extends to states you might not expect. 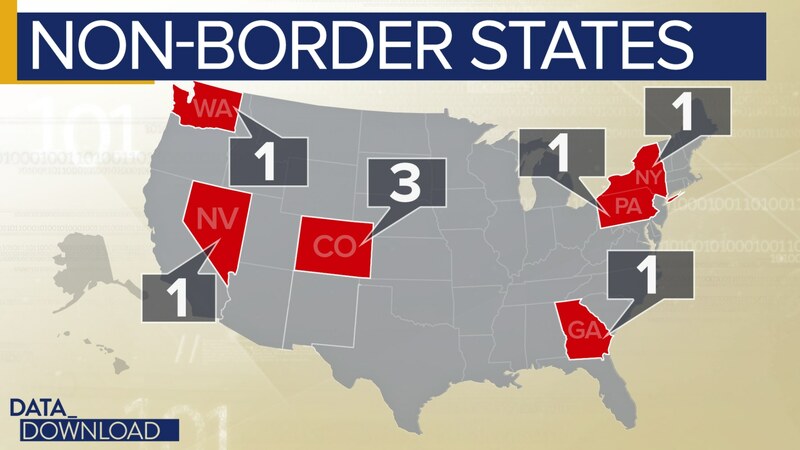 There are three in Colorado and one each in Georgia, Nevada, New York, Pennsylvania and Washington state. And if you expand the Hispanic population number down a bit further to 15 percent of the total district population, the scatter of GOP seats in the group grows broader to include districts in Kansas, New Jersey, Oklahoma and Utah. None of this means the Democrats’ shutdown approach to DACA is a slam-dunk, of course. Americans are not fans of government shutdowns. They are not always easy to end and blame can be a difficult to fully and properly assign. It could be that the shutdown leads Republicans to rally around their president and their party in the fall. It could also be that a shutdown would strengthen Democratic voters’ resolve to vote or that it frustrates independents and makes them less interested in coming out on Election Day. But the Democrats’ strategy in Washington’s latest game of “shutdown chicken” has some important data behind it — at least as the numbers currently sit. And the most important number of all in 2018 may be 24: the number of seats the Democrats would need to net in November to take back the House. 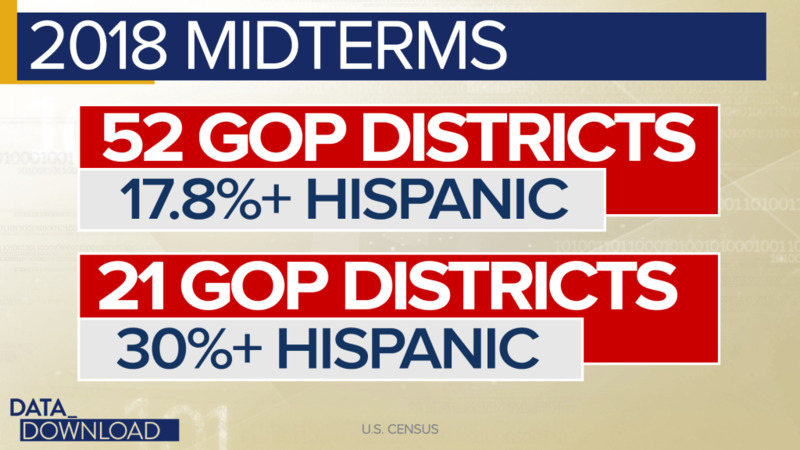 If the Democrats are actually going to win that many seats this fall, these GOP-held districts with large Hispanic populations are an important target for them.